AT&T's new Watch TV service comes free with the new &More plans, but is also available to anyone for $15/mo. UPDATE: The new AT&T plans went live this morning (June 28th) - and we've been digging deep into the fine print. 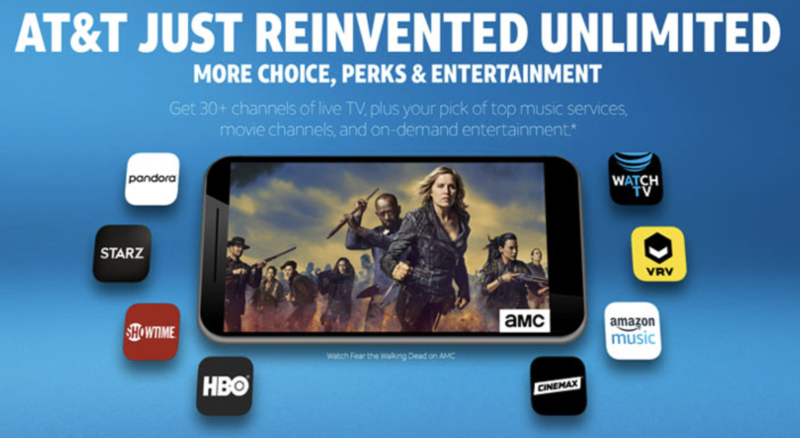 You can only change between the free premium channels (HBO, Showtime, Starz, Cinemax, Pandora, Amazon Music, or VRV) that come with the &More Premium plan once every twelve months. This seems designed to prevent people cycling from network to network binge-watching shows, but it is extremely annoying if you decide you don't like a particular service and yet still end up stuck for a year. AT&T's Watch TV streaming service will be available for iOS, Android, Apple TV (4th gen or newer), Amazon Fire TV (2nd gen or newer), Google Chromecast (2nd gen or newer), Samsung Smart TVs (2017 models or newer), and on computers with the Chrome or Safari web browser. Though Watch TV is free for AT&T &More plans subscribers, anyone (even non AT&T customers) can subscribe directly for $15/mo. There is a seven day free trial available to check it out. Watch TV only allows for one stream at a time per account - so even if you have ten lines with AT&T only one person can watch at a time. This is extremely limiting for multi-line families. If you stream via the smartphone app, AT&T is not counting Watch TV data usage against your 22GB network management threshold, saying: "If you’re on an AT&T postpaid data plan or eligible prepaid data plan, streaming the WatchTV app over the AT&T wireless network will be data-free and not count against your allotted data, including congestion management." But... Once you have crossed the 22GB threshold, even Watch TV viewing may be subject to network management slowdowns. AT&T explains: "Content viewed within the WatchTV app does not count towards the 22GB monthly threshold. 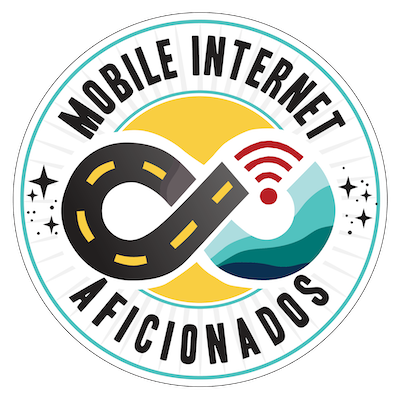 But, once your threshold is met and you are in a congested area, network management will apply to content delivered by the WatchTV app, just like all other content delivered by the AT&T wireless network." 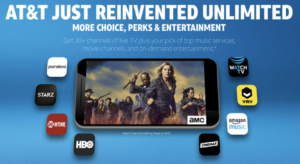 AT&T support says that DirecTV Now app is being given the same preferential treatment - with streaming data not counting towards the network management threshold. We have not seen this in writing yet, so we await experimental confirmation. This is definitely a sign of AT&T taking advantage of the end of Network Neutrality rules to favor its own services. UPDATE: DirecTV Now also is officially getting Data Free streaming support. On the AT&T &More Premium plan, "Stream Saver" is enabled by default and will throttle all video to 1.5Mbps to force 480p resolution. You need to manually disable this "feature" to get 1080p video. Be sure to turn off Stream Saver to fully take advantage of this plan! On older plans, disabling Stream Saver allowed for fully unthrottled video streaming - we regularly watch 4K video this way. It seems that according to the fine print the &More plans now throttle video to 1080p even if Stream Saver is off, though we are waiting for testing reports to confirm this. Picking a cell plan is becoming increasingly like picking a cable TV bundle. Verizon isn't the only carrier tacking additional superlatives onto its "unlimited" plans. Today AT&T is announcing that as of June 26th (delayed until June 28th) the AT&T "Unlimited Enhanced" plans will be retired, replaced with the new AT&T "Unlimited &More" and "Unlimited &More Premium" plans. "We were the first wireless provider to pair entertainment and unlimited data. That’s because unlimited is pretty limited without entertainment. So now we’re taking it even further to give you more for your thing." And while these plans now come bundled with AT&T's new 30-channel "Watch TV" live streaming service (presumably this is for your "thing"), they actually have nothing new to offer mobile internet users more interested in an "Actually Unlimited" plan with ample shareable data. Particularly if you have an older AT&T plan that has any truly unlimited hotspot lines on it, do NOT be tempted to switch to these new AT&T plans! But if you instead are looking for a live TV and internet bundle - the "&More" just might be appealing to you. NOTE: Not a typo, the official AT&T way to write the new plan names is "&More" without a space. Who comes up with the names for these plans?!?! 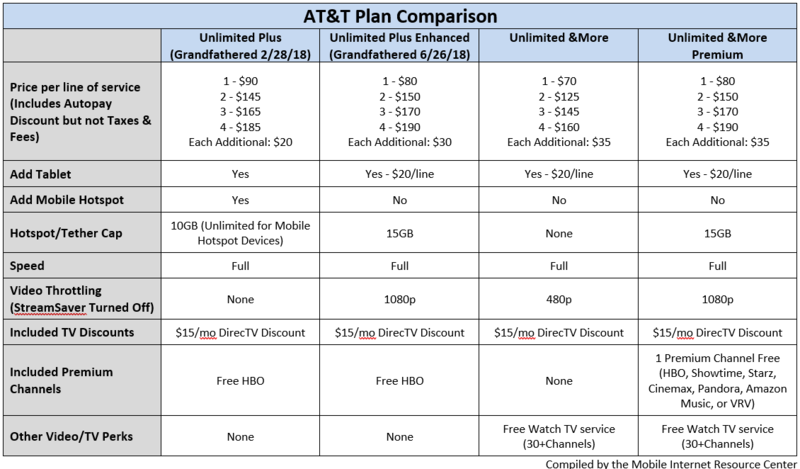 The Unlimited &More and &More Premium plans are only slightly changed from the Unlimited Enhanced Plus and Enhanced Choice plans - though they are slightly more expensive for the basic &More plan compared to the Enhanced Choice, and the price for additional lines beyond four has gone up across the board . Unlimited &More - Unlimited talk and text, and on device data, network managed after 22GB. 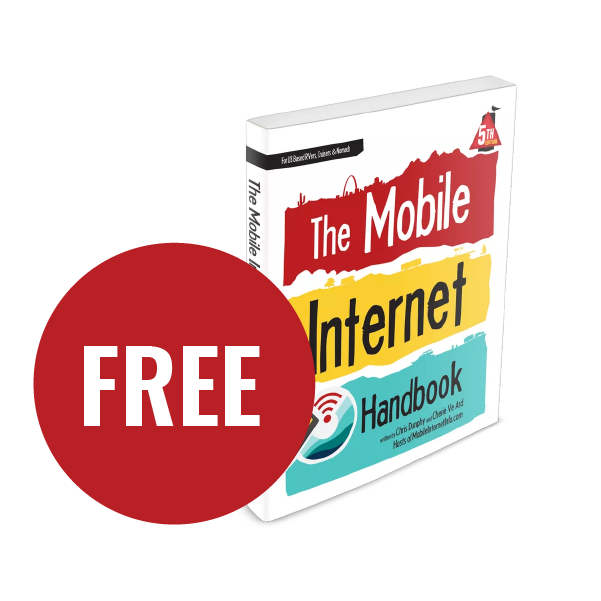 NO tethering / hotspot usage. All video is throttled to 480p resolution. Starts at $70/mo for a single line (after auto-pay discount). Unlimited &More Premium - Unlimited talk and text, and on device data, network managed after 22GB. 15GB of high-speed tethering / hotspot usage. All video is throttled to 1080p resolution. Starts at $80/mo for a single line. Plus you get to pick a single free premium service. The premium options available with Unlimited &More Premium are HBO, Showtime, Starz, Cinemax, Pandora, Amazon Music, or VRV. This choice of perk replaces the free HBO option that had been available with many AT&T plans in the past. BTW - if "Watch TV" is not enough channels for you, AT&T customers on the new plans remain eligible for a $15/mo discount on DirecTV or DirecTV Now service. AT&T's Watch TV channel lineup. Now that AT&T owns both DirecTV and Time Warner, the company's focus is very media centric. AT&T's new Watch TV service is launching with 30+ live channels - with more coming. The focus of course is channels that AT&T now owns. Popular channels bundled include AMC, IFC, Sundance, BBC America, A&E, History, Lifetime, Animal Planet, Discovery, Food Network, HGTV, TLC, Cartoon Network, CNN, TNT, TBS, TCM, and more. In the near future various Viacom channels (like Comedy Central) will be added to the mix as well - but the traditional national networks and sports channels are unlikely to be included any time soon. Channels will be available live, and some shows and movies will also be available on demand. If you miss a scheduled broadcast time, you will be able to rewind up to 72 hours to catch up on what you've missed. But presumably, commercials will not be skippable. The Watch TV service will debut with an iOS and Android smartphone app, and will also be watchable via web browser and via various streaming devices. 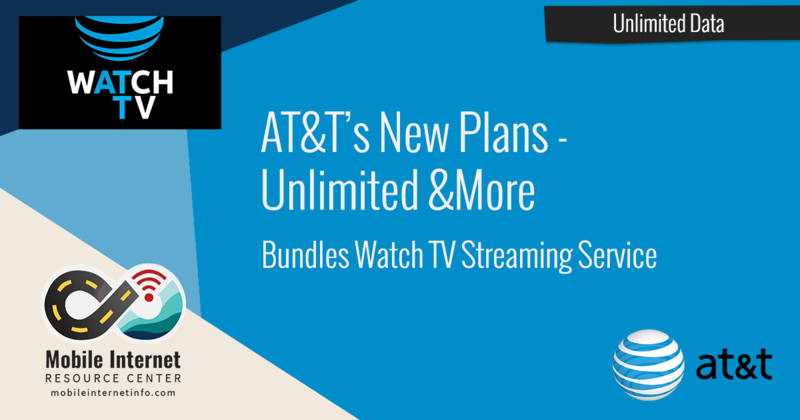 The new Watch TV service is debuting bundled with the AT&T "&More" plans, but it is also available for anyone to subscribe to for $15/mo - even if you are not otherwise an AT&T customer. TIP: If you have an older AT&T plan and are interested in Watch TV, you might find it is actually cheaper overall to add Watch TV on to your old plan for $15/mo rather than upgrade to the new more expensive bundled plan. AT&T's is all about video streaming. With Network Neutrality essentially dead and media mega-mergers ramping up, what we are seeing with AT&T's latest plans is likely to be just the beginning of TV, Internet, and Cellular growing increasingly tied together. Verizon has made no secret of its own ambitions in this space, and T-Mobile has said that it plans to soon bring the same sort of disruptive energy to the TV streaming world it brought to cellular. A lot of these ambitions come down to advertising. If carriers can monitor what you watch and where you surf they can build up profiles that become extremely valuable for targeting you. If you thought ads that followed you around web sites were annoying, just wait until they start popping up on top of the shows you watch too. TV & Movie Entertainment on the Road: Streaming, Downloading & Alternatives - Our featured in-depth guide.